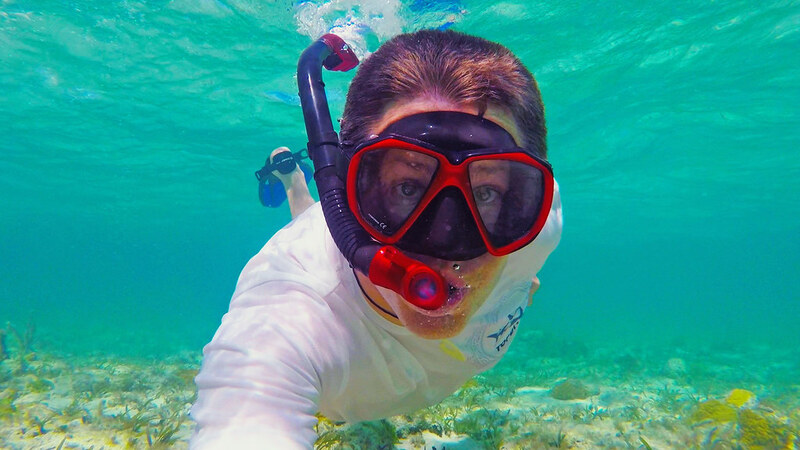 Snorkeling is simply an awesome and fun way to explore the underwater environment even without having scuba gear and having to dive (it’s especially great for people who are afraid of diving and/or want to first try something much easier). Snorkeling will enable you to properly enjoy observing underwater life in all its glory, in a comfortable manner, on your own time. You have to know how to swim of course, that would be the obvious first requirement. The equipment is a lot smaller and lighter than what you would need for diving. You basically need 3 items: a mask, a snorkel and fins. These come in different shapes and sizes so you can easily find equipment that fits you perfectly and that you’ll be comfortable with. It would be wise to get a full face snorkeling mask that comes with the mask and snorkel included. Anyone can learn snorkeling, even kids supervised by adults. It is important to learn how to properly adjust your equipment, and follow simple guidelines for being in and around the water. There are several snorkeling techniques that include surface swimming, clearing the water from the snorkel, or checking buoyancy. These aren’t complicated and can be learned quickly by anyone. Wear your mask right: Make sure that the mask you purchase fits your face. While holding the snorkeling mask to your face, try breathing through the nose. If you notice the mask seals properly and stays in place without you having to hold it, you’re good to go. If air leaks into the mask, water will come in as well, and you definitely don’t want that. Fins shouldn’t be too tight: while the mask needs to fit to perfection, you don’t need your fins to be too tight. You want them to fit just fine, without giving you cramps. It’s a good idea to have slightly bigger fins than smaller ones. Defog: learning how to defog is another requirement for when you go snorkeling. There are several ways you can achieve this. You can buy defoging gels for your lenses, but another cool trick is to use crushed leaves. A single small drop of Johnson’s Baby Shampoo washed with ocean water will also help your mask defog. Practice breathing: Always practice breathing outside of the water first, especially if you are a beginner. Put the mask on and breathe through the snorkel. Don’t bite it, but simply rest your teeth on it, otherwise your jaw will begin to hurt quickly. Simply practice breathing so you get comfortable with breathing through the tube. Then attempt to do it under water. Practice in the classic floating face down position. You’ll begin to start seeing cool things underwater which will in turn help you focus and forget you’re actually breathing through a tube. It will quickly feel quite natural and not at all scary. So if you are interested in snorkeling, try it today, you won’t regret it! Good clean fun with your friends and family! To really enjoy the amazing activity that is snorkeling, you need amazing spots. Spots where the underwater life is flourishing, where there are countless types of fish, corals and vegetation to experience. We’ve put together 3 top spots from around the world that you should definitely visit in your lifetime! Right off the coast of Brazil, in between Sao Paolo and the famous Rio de Janeiro, you can find a wonderful location called the Ilha Grande. While you can of course find hotels on the island, it feels like it hasn’t really been touched by human life. The monkey rich jungles are surrounded by the prettiest blue water you’ll ever see, and the fish are of all shapes and sizes. When you dive into the warm water of the Lagoa Azul, you’ll enjoy swimming and snorkeling with seahorse, turtles and angelfish to just name a few. You might even find some shipwrecks from long ago battles between pirates! No way could we make a list about top spots around the world to swim and to go snorkeling without including the breathtaking Big Island in Hawaii. This well known archipelago is simply filled with tons of great spots for snorkeling. While here, going to Kealakekua Bay is an absolute must – here you will experience an underwater state park with some of the most beautiful fish you’ll ever see. It is also the famous place where James Cook landed – you can see his monument and learn about the history of the place as well. Cool underwater adventures can also be had in the crystal clear water of Honaunau Bay with its mesmerizing coral gardens and dolphins. The Maldives are a destination you simply do not want to miss, but what the islands have to offer above water is still nothing compared with what they offer underwater. Here you will encounter and enjoy up to 700 different species of fish, coral, turtles and even the odd neighborhood friendly octopus! The water is crystal clear, and the experience cannot be put into words. You do not want to miss this one, so make sure it sits firmly on your bucket list! The truth is, anyone of these locations are perfect for snorkeling, swimming and having the time of your life. Make it your goal to visit them. You won’t regret it! So you want to go snorkeling, you have your equipment, you’re all set and ready to go. Just hold on for one moment and consider reading about these 3 snorkeling mistakes you absolutely want to avoid. By following this advice you’ll be able to have a more enjoyable experience while also staying 100% safe. Look we get it, maybe you’re just trying this out for the first time and you’re not ready to spend too much on the really good equipment available. But understand that having cheap equipment pretty much always means that equipment is not really that good. The mask won’t fit you properly and water will make its way through, basically ruining your snorkeling experience. Yes, you’ll likely have to spend a few dollars more, but it will be worth it. You’ll have fun and the equipment will work properly. Same goes with the snorkel and the fins. If they are low quality, they’ll be more of a hindrance that will prevent you from having fun. It is crucial to have optimal equipment to really enjoy this activity. You may not have considered this, but not all locations are the same. Some will be better than others and it is important to pick wisely to fully enjoy the beauty found underwater. First off, especially if you are just starting out, it is never a good idea to go out on a boat and try to perform snorkeling directly in deep water. Start on shore, get comfortable, and find a spot where there is more life underwater. Look for fish and corals until you find an appropriate spot. A lot of first time experiences have been ruined – or simply unimpressive – because they simply didn’t know how to choose a good spot. You shouldn’t attempt snorkeling if you aren’t at least a decent swimmer. You need to feel comfortable in water, otherwise you’ll panic more often than not, ruining your whole experience. Stay relaxed, and swim slowly. This isn’t a marathon, but an experience that doesn’t need to be rushed. Go at your own pace, and resist trying to follow others who might go faster or deeper. Take care of yourself and don’t push the limits if you are not comfortable doing it, or you’ll get exhausted quickly. One basic hazard to know is if it’s windy and there are waves. In some situations you should avoid snorkeling at all, and in others you should take the weather conditions into account and adapt. Don’t go towards deep water and stay near the shore, in a good spot with good underwater life. Make sure to follow these tips to have the most amazing experience possible! Snorkeling is insanely fun when done right! | Theme: Amadeus by Themeisle.